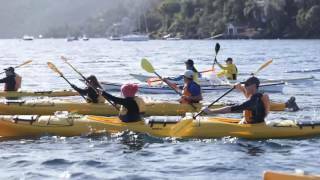 Taking a Kayaking Guided Experience with Sydney Harbour Kayaks gives you the chance to you see sights only visible from the water. Paddling in safe and stable double sea-kayaks you can explore the sheltered harbour waterways. You will coast past beaches, cliffs, stunning houses built on impressive inclines, then, not too far along you can continue beside relatively untouched bushland. Move effortlessly across a calm glassy surface or enjoy the excitement of paddling through gently undulating waters. If the tide is high, you can even journey under a canopy of foliage from the surrounding mangrove trees. With their Public Tours you can choose from their two hour Coffee Tour where you can paddle past Castle Rock Beach, Grotto Point and Balmoral on the southeastern side of the Spit Bridge, or their four hour Kayak Eco Tour which takes you under the bridge and further into Middle Harbour alongside the Garigal National Park.